If you are having problems viewing this page or the graphics please Click Here to view it in your browser or to visit our Blog Click Here. To view my Galleries of Geo-referenced photos from around the world Click Here. To view additional galleries Click Here. To view as a Web Page Click Here. Please visit our Web Site at http://henstridgephotography.com. All Photos, Images, Graphics and Text are the copyright of Fred Henstridge Photography. All Rights are Reserved. Entrance to Temecula Old Town. 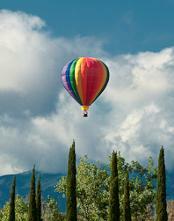 One of the annual events in Riverside County for the past 26 years is the Temecula Valley Balloon and Wine Festival. The festival takes place at the Lake Skinner Recreation Area in southwestern Riverside County each June. This year it held from June 5th though June 7th. The festival is probably is the single largest event in the Temecula Valley each and this year was no exception. 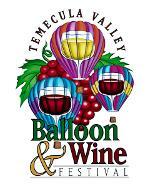 While not as large or publicized as the annual Albuquerque Balloon Festival the Temecula Valley Balloon and Wine Festival is every bit as good and probably easier to get attend. The setting for the Festival is the beautiful Lake Skinner Recreation Area in southwestern Riverside County about 40 miles south of the City of Riverside on Interstates 215/15 and 70 miles north of San Diego on I-15. If you are driving you will exit I-15 at Rancho California Road and then go east through the Temecula Valley vineyards. Once you are on Rancho California Road there will be plenty of directional signs along the way, so you can’t miss it. Come early as balloons fly best in the calm, cool and dry morning air. They don’t like hot, humid weather or wind and fog. The TVBWF is sponsored by the business community in the Valley including the 34 wineries that consider themselves a part of the Valley. The Temecula Valley has been a grape growing and wine producing region for over 189 years and is home to some of the best known wineries in California. Wineries such as Callaway, Ponte, South Coast, Thornton and Wilson Creek are but a few of the better known vintners in the valley. Temecula Valley was home to Native Americans for around 10,000 years before it was first colonized by Christian missionaries in the 1820s. In 1820, the first vineyards in Temecula were established at the mission. Since then wine making has been produced in Temecula valley. Once the 1960's rolled around developers started really developing Temecula Valley and the first wineries were established; Bella Vista Cilurzo Vineyard & Winery and Callaway Winery, established in 1968 and 1969. From that point different grapes were brought in and several more wineries were built making Temecula Valley the largest wine producing area in Southern California. Many of the grapes used to make wine in Temecula Valley are grown at the local vineyards. The warmer climate of Temecula Valley allows vineyards to produce a wide variety of grapes. Temecula Valley is known for growing grapes that thrive in warmer climates such as Zinfandel, but rarely grow cooler climate grapes such as Pinot Noir. Pinot Noir is generally found in Europe and northern California/Washington state. In 1999 a major outbreak of Pierce's Disease devastated the vineyards in the Temecula Valley, destroying more than 200 acres of vines and resulting in an estimated $1.2 million in damage to grapes alone; to say nothing of the cost of replanting what was ruined. Since then most of the vintners have replanted their vineyards and are now thriving. Over the past decade there has been a major increase in tourism to the valley and there are more vineyards and restaurants, wider roads and hotels. With the blend of vineyards, orange groves, and clear blue skies mixed with the view of the surrounding mountains and seven golf courses the Temecula Valley is becoming one of California’s premier tourist destinations. 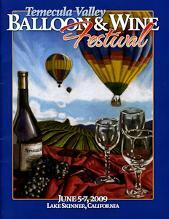 The Temecula Valley Balloon and Wine Festival, then known as the Rancho California Balloon and Wine Festival, was started in 1983 by Walt Darren, a commercial airline pilot and avid balloonist and by Evelyn Harker a veteran event organizer and fund raiser. Evelyn immediately suggested it might "fly" even better if it involved some of the area’s other natural attractions such as wine tasting, culinary presentations and entertainment. With an enormous task ahead, the assistance of two other community-minded individuals, Sherry Prysock and Mike Flaherty was enlisted and Evelyn became the first event chair person. The seed money was provided by Kaiser Development Company and sponsors came from the local community giving what they could with many contributions consisting of in-kind services and products. At this time, there were only six wineries in the region. The first Balloon and Wine Festival was launched in the spring of 1984 and was a monumental success for a town of only 9,000 residents. More than 4,000 people were in attendance that year as 35 balloons were launched from the Rancho California Plaza area off Ynez Road (now Tower Plaza). The balloons flew over the serene pastures surrounding the area and the wine tasting was held in the parking lot of the current Tower Plaza. As the Festival grew, music was added and the event was moved to the Sports Park. In 1986 as the event continued to grow, it was moved to Cherry Avenue and the first ever poster contest was held. During 1987-1988, the Festival was moved back to the Sports Park and in 1989; it was moved to its current location at Lake Skinner. In the beginning, parking was not even allowed on the Festival park grounds. In 1988, a landmark year by all accounts, the Festival featured live big name entertainment with the Coasters and Little Anthony and the Imperials. In 1991 the Beach Boys entertained to growing crowds of locals and newcomers alike. Some of the early stages used were "handmade" by volunteers which are a far cry from the sophisticated audio and light productions of recent years. Kathy and I arrived at the Lake Skinner Recreation Area about 6:00 am on Saturday morning as the crowd was just beginning to fill the balloon launch area. As we were driving into the Lake Skinner area we noticed vans and trucks laden with balloon gear driving out. Our first thought was, oh no, not again, just like last year when there was fog, that the balloon rides would be canceled. They were not canceling the balloon flights, just moving to the vineyards to the southwest along Rancho California Road, where the skies were clear and little wind. We decided to hang out at the Lake Skinner balloon launch site to take photos of the remaining balloons. These balloons would be inflated and offer tethered flights to the public. This was a better place to take the close up photos of the activities involved in launching a balloon and learn more about balloon flight. My only regret is that I did not take a tethered flight so I could get some good aerial views of the festival site. Oh well, just another missed opportunity in my life. We stayed at the festival site until 9:30 am and then decide to leave and get some breakfast in Temecula. On our way to Temecula we stopped several times along the road to get some great shots of the balloons over the vineyards and orchards in the valley. One thing to note is that there is a $5.00 fee for parking, but you can leave and return at no extra charge. Just hang on to your paid parking pass. We returned to the festival grounds at 6:30 pm so we could see the balloon glow. 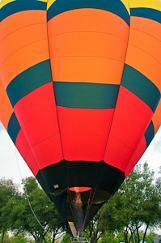 This is always the highlight of any balloon festival. Once it is dark the balloon crews roll out their balloons and burners and inflate the balloons. The balloons and baskets are tethered and inflated to their full capacity. Once the balloons are fully inflated the pilots turn on those double propane burners full blast and light up the interior of the balloons. This is quite a sight to witness and a great photo opportunity. Naturally I took more photos that I really needed, but it was a lot of fun. Tips for Photographing a Balloon Glow Event. Photographing a balloon glow event can be fun and rewarding, but it can also be frustrating and disappointing. Here are a few tips that can help turn those disappointing shots into winners. First of all a comment about tripods. The “book” states that you should use a tripod for available light night shots. I won’t dispute that, but I elect not to use a tripod at these events when I am as close as I was to the balloons. Why, you ask do I propose this heresy? I don’t use the tripod, because it cramps my style. I like to move around to get different angles and views of the glowing balloons. You may then ask, how do you get those sharp, well exposed images? The answer to that question is a little more complex. First, I have a good digital SLR camera (Nikon D300) with very good 12MP sensor. The sensor does not generate a great deal of luminance or color noise (those nasty little color splotches you see in the enlarged image) at higher ISO settings. I shoot every image in camera raw so the camera’s internal software does not mess around with the image. This means I have to process the image in Adobe Photoshop or Lightroom to obtain the final useable photo. Second, I use fast lenses that can stop down to f/4.0 or lower. Third, I use a vibration reduction (VR) or image stabilization lens (IS) whenever possible. I also practice holding the camera steady prior to shooting. This means placing your right or left elbow against your body and bending it upward to allow the hand to cradle the camera under the lens. This will give you the maximum stability for a hand held shot. And fourth, try to meter on the light from the balloon when it is glowing and then set that exposure. You want to properly expose the glow of the balloon and not try to meter on the background or ambient light. Let it go dark or even black. It highlights the balloon and draws the viewer’s eye to it. The images of the balloon festival displayed in my galleries were shot at ISOs ranging from 400 to 1600 using either a Nikkor 17-55mm f/2.8 or Tokina 12-14mm f/4.0 lens. I have included the shooting data in the caption of most of my balloon glow photos so you can see how well my technique worked. For you folks using one those point and shoot digital cameras I strongly recommend that you go by the book and use that tripod. These cameras don’t have the mass to be held in the manner I prescribe and their lenses are two slow to get the shooting speed up to above 1/30 of a second. By all means shoot wide and do not zoom. You decrease the light passing through the lens and you magnify the slightest amount of movement. Shoot wide and crop in your processing software. Also, if you can, set the camera to manual and set your ISO to the highest settings the camera will allow and take a few test shots. Look at the little histogram (the thing that looks like a mountain range) on your LCD display screen. Make sure the mountains appear to be centered. This means you are capturing most of the digital data well within your cameras processing range. Once you have tested your shooting settings secure the camera to the tripod and gently press the shutter release each time you snap. I would recommend using the self timer to avoid camera shake from pushing the shutter, but the 10 second lag could cause you to lose the glow the instant the burners light the balloon. They are lighted for only 3-5 seconds. One more tip. Turn the flash off. It does not add anything and only tells the camera to do things you do not want it to do. I have always had a fondness for the Temecula Valley, that’s why we live a mere 15 minutes north. The days are warm and sunny with mid-day summer temperatures reaching 95-100 degrees, but the humidity is low. The average summer temperature is in the high 80’s with nighttime lows in the low 60’s, around four in the afternoon a ocean breeze begins to blow through a pass in the mountains to the west called the Rainbow Gap and the temperature begins to moderate. This breeze blows in from the Pacific Ocean and is laden with moisture, that’s why the valley a prime grape growing region. The Temecula Valley is one of fastest growing areas of Southern California. There is plenty to do and see in the area. 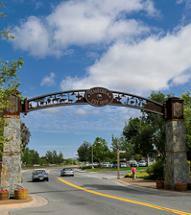 The City of Temecula has a very picturesque Old town centered on a Farmers Market with boutique shops and restaurants. As mentioned above there are seven golf courses with the most famous being at the Temecula Creek Inn with its excellent restaurant. For shopping there is the newly expanded Promenade Mall with an abundance of shops and restaurants and plenty of indoor parking. If you are planning a weekend getaway the City of Temecula is home to 17 major hotels such as the Embassy Suites, Hampton Inn, Ramada Inn and other major brands. To experience a weekend in the vineyards you might want to visit the South Coast Winery Resort and Spa for some special treatment. If you like Las Vegas you will surely become a fan of Pechanga Resort and Casino. Pechanga offers you casino gaming at a first class casino, 11 restaurants, a first class spa and world class 18-hole golf course. If you are planning a weekend getaway you might consider a side trip of a few miles south to the Mt. Palomar Observatory. The Palomar Observatory is located in north San Diego County, California. It is a world-class center of astronomical research that is owned and operated by the California Institute of Technology (Caltech) and it serves as the home to five telescopes that are nightly used for a wide variety of astronomical research programs. The most famous of these telescopes is the 200-inch Hale Telescope. The observatory is open daily except December 24 and 25. Visiting hours are from 9:00 a.m. to 4:00 p.m. while Daylight Savings Time is observed and 9:00 a.m. to 3:00 p.m. while on Standard Time. It’s a great place to take the kids and learn about the universe that surrounds us. We enjoy our time spent in the Valley and try to spend some time there each week for shopping, dining or just plain sight seeing. Next year I am going to take one of those tethered balloon rides so I can get those aerial shots of the balloon staging area. I hope the weather permits. If you are interested in obtaining a poster print of the festival, balloon glow or some other travel selection please visit my Fine Art Poster Gallery by clicking here. 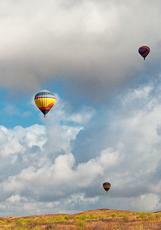 Please click here to visit our gallery of images from the Temecula Valley Balloon and Wine Festival. If you are interested in obtaining prints of the balloon or to download full size digital images please click here. For additional scenes of the Temecula Valley, Old Town and the Vineyards click here. Please note that when you click on some of the photos you will see a larger image on my commercial gallery where you can order prints or download full resolution digital files of the image. You might also want to visit my gallery of Fine Art Posters where you can view and purchase 16x20 inch posters of the festival or other travel sites. If you would prefer to view these Temecula Scenes on photography Web site please click here. Click on any of the images above to see a larger version. Roll your mouse over the large image an click on the “i” symbol to see the shooting Data. Entrance to Thornton Winery, one of the finest in the Valley. A fine dinning experience.